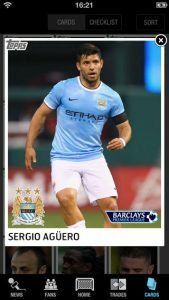 KICK: The Exclusive Barclays Premier League Digital Football Trading Card Gameis an iPhone game developed by The Topps Company. KICK is quite similar to BUNT, another excellent Topps sporting/game app we reviewed earlier this year. We gave BUNT a 9, the same score as KICK. Both are excellent apps, provided you follow their respective sports. In Topps KICK, the cards you play with change in value based on actual on-the-field performance of the players. All of this happens in real-time, which is pretty killer. 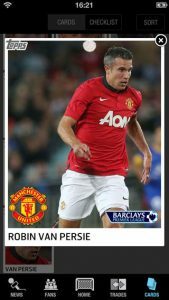 Top footballers featured on cards in this game include Robin Van Persie, Sergio Aguero, Santi Cazorla, and Juan Mata. I love the interface here. It’s really excellent: easy to navigate, and easy on the eyes. Exactly what you want when you’re playing a TCG like this. KICK is a lot of fun because you can also learn a lot of trivia and stats about the various players. No matter what club you support, there’s great fun to be had here. With head-to-head challenges, trivia contests, and scavenger hunts to enjoy, there’s always something to do! If you’re a footie fanatic, then you probably should get this app installed on your phone ASAP. Topps has definitely knocked it out of the park again with this app. KICK: The Exclusive Barclays Premier League Digital Football Trading Card Gameis compatible with iPhone 3GS, iPhone 4, iPhone 4S, iPhone 5, iPod touch (3rd generation), iPod touch (4th generation), iPod touch (5th generation) and iPad. Requires iOS 5.1 or later. This app is optimized for iPhone 5.